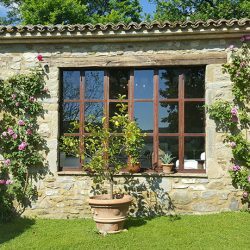 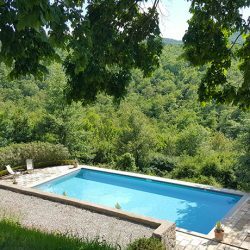 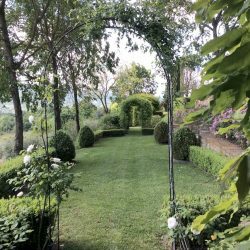 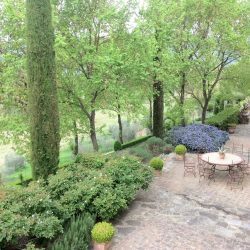 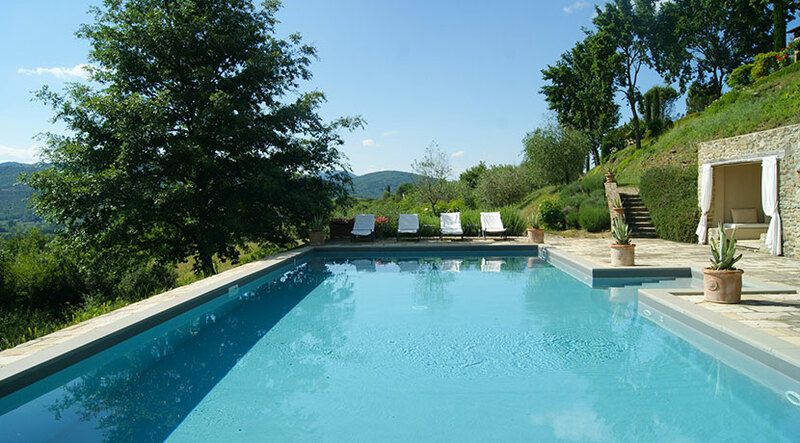 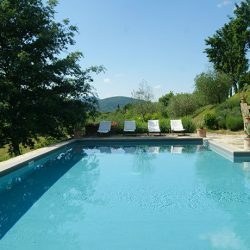 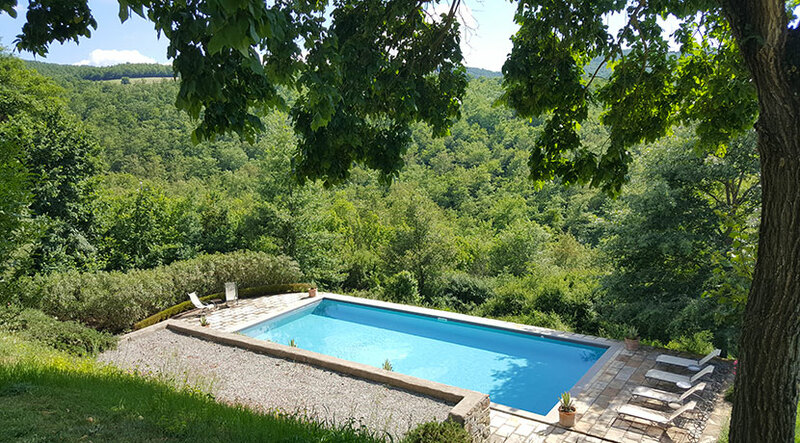 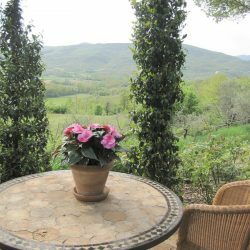 Stunning restored, 3-4 bedroom farmhouse with a guest apartment, annexes, pool and delightful garden near Lake Trasimeno in Umbria. 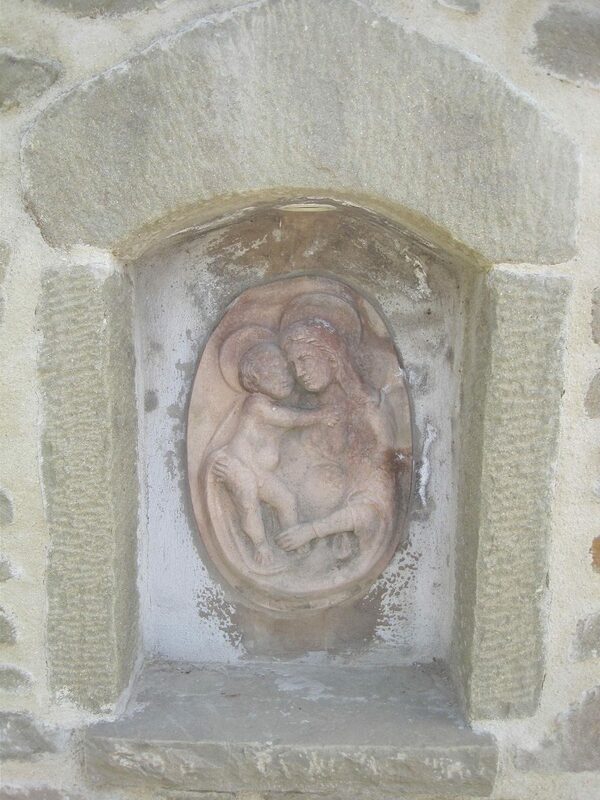 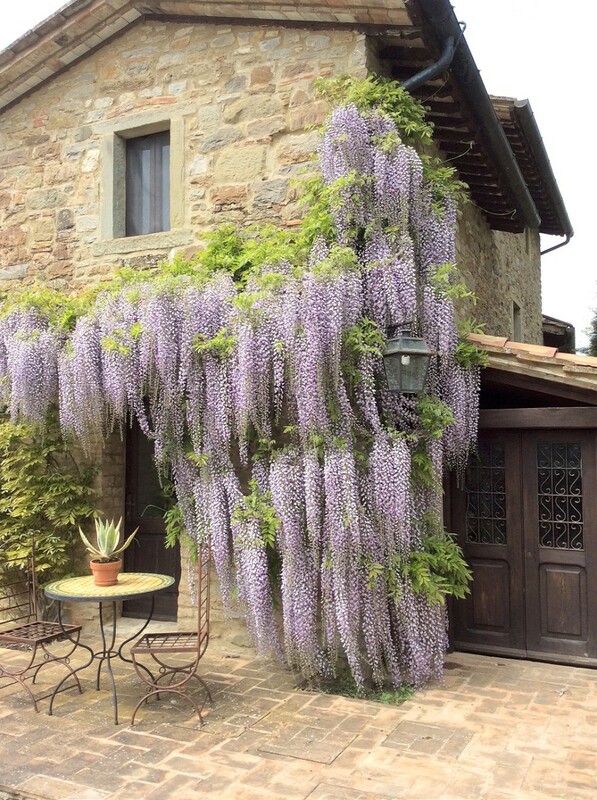 Lake Trasimeno Property. 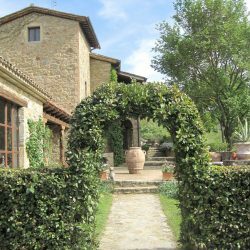 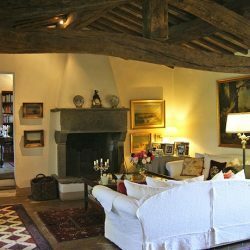 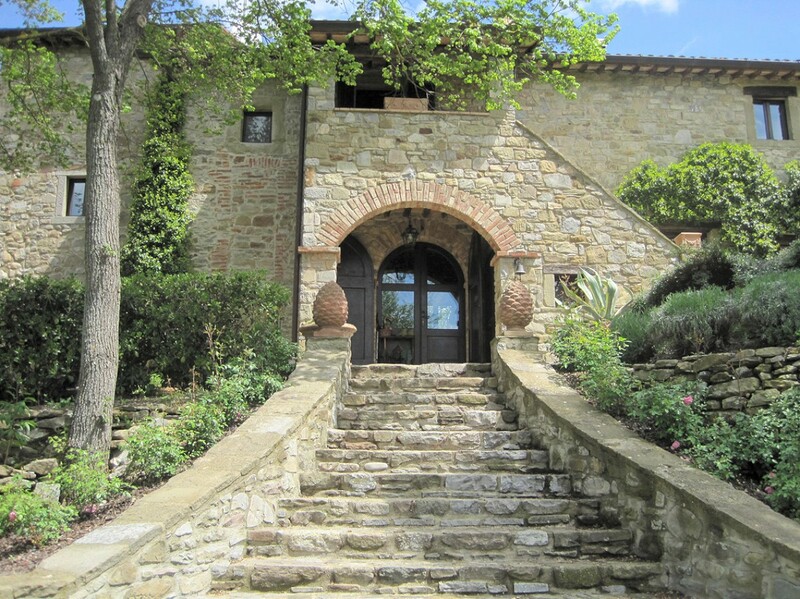 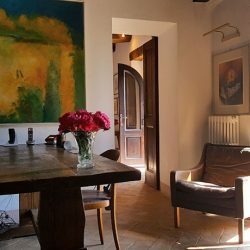 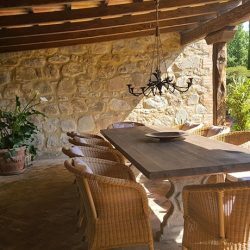 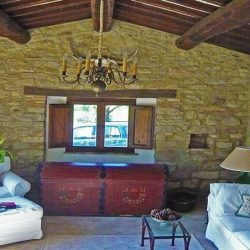 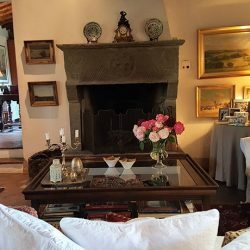 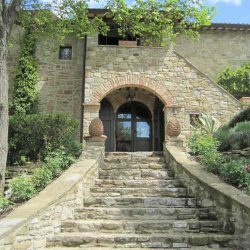 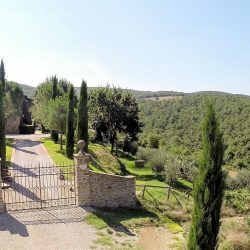 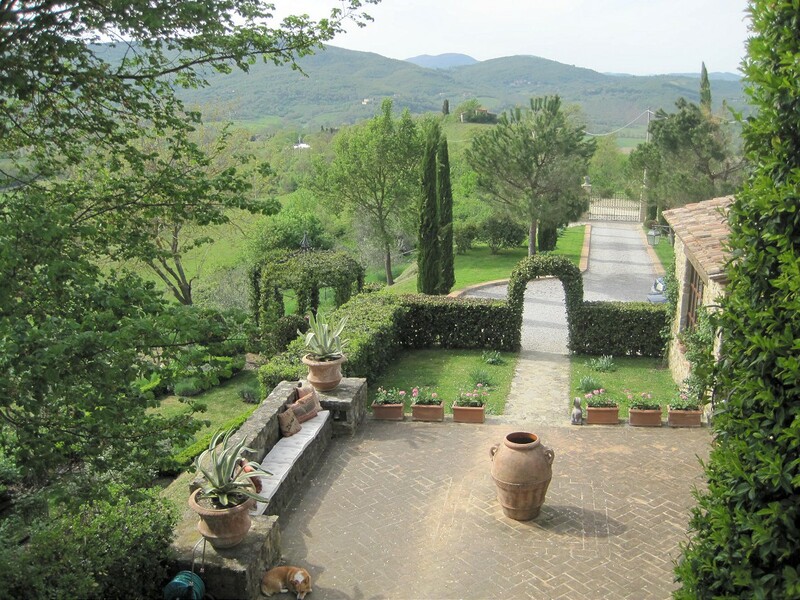 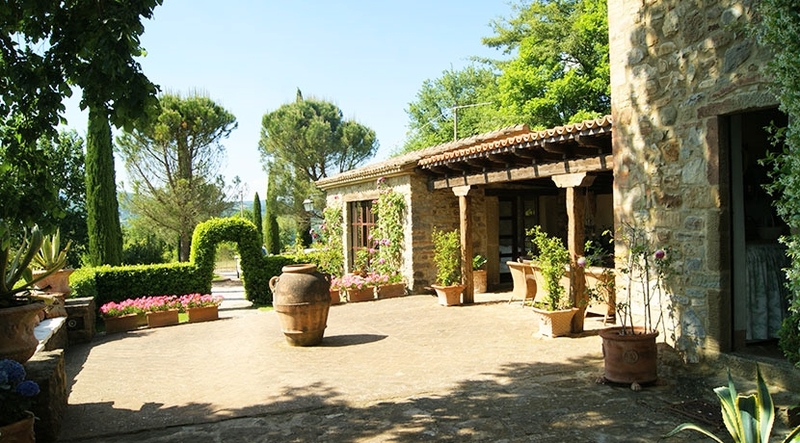 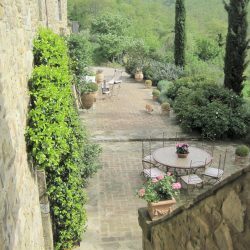 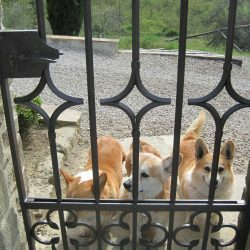 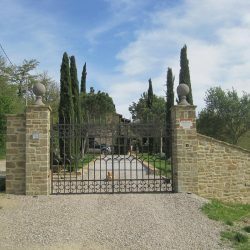 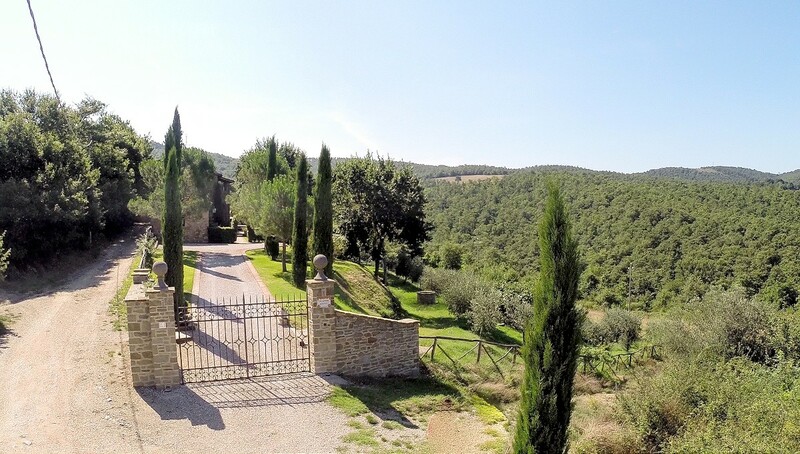 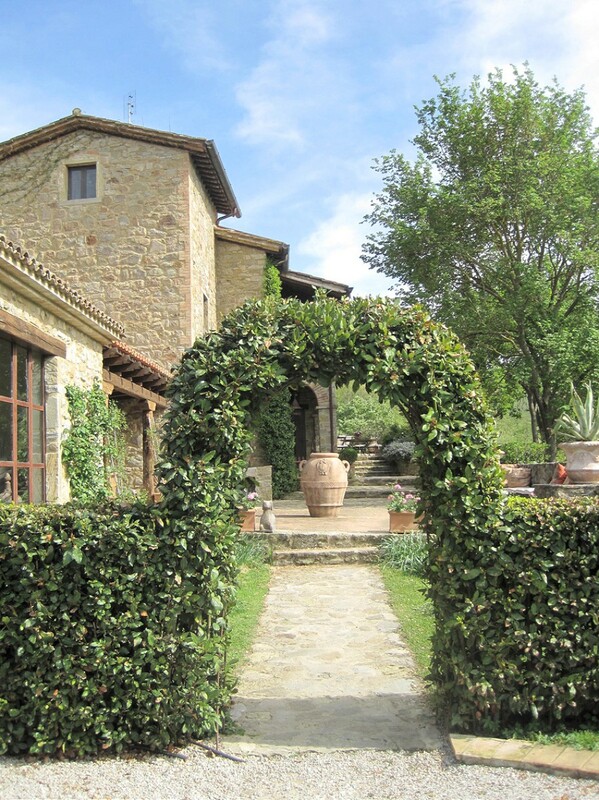 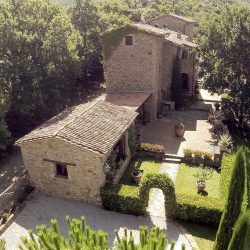 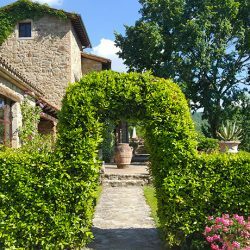 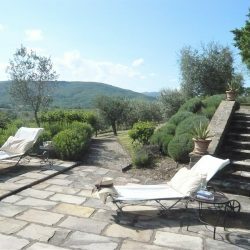 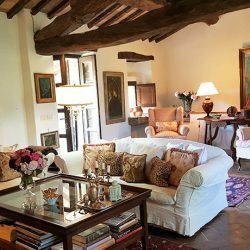 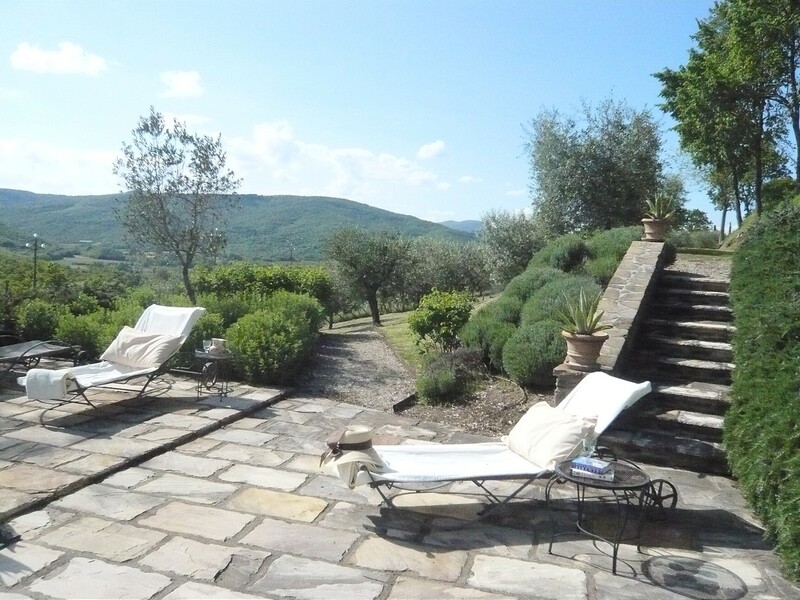 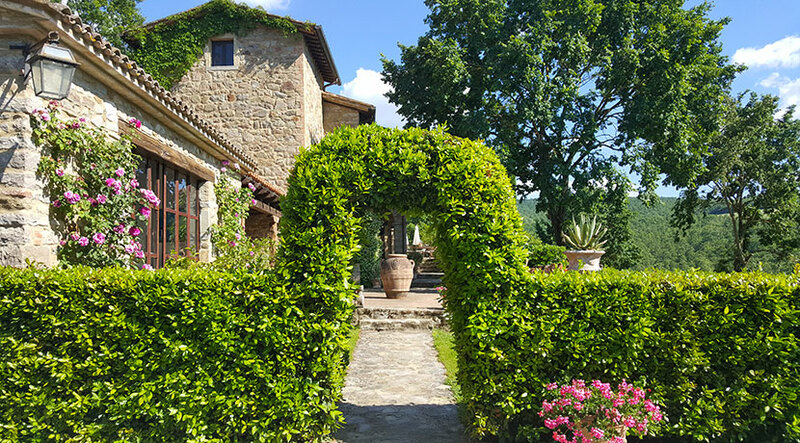 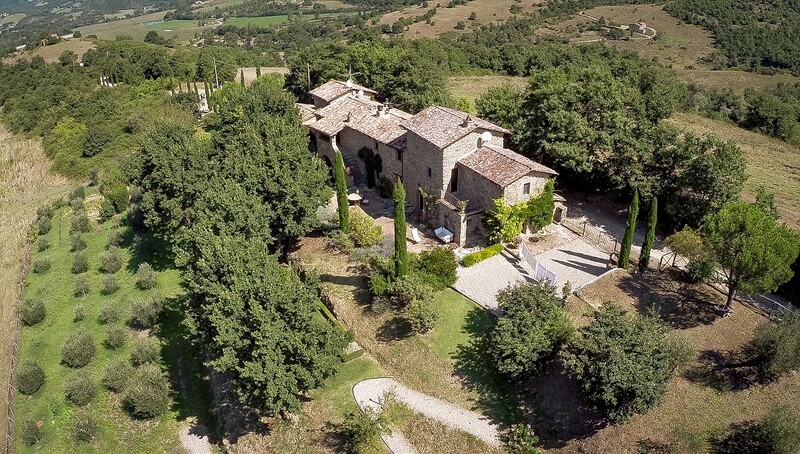 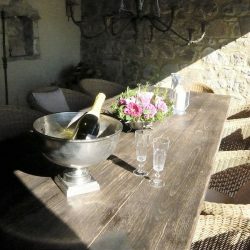 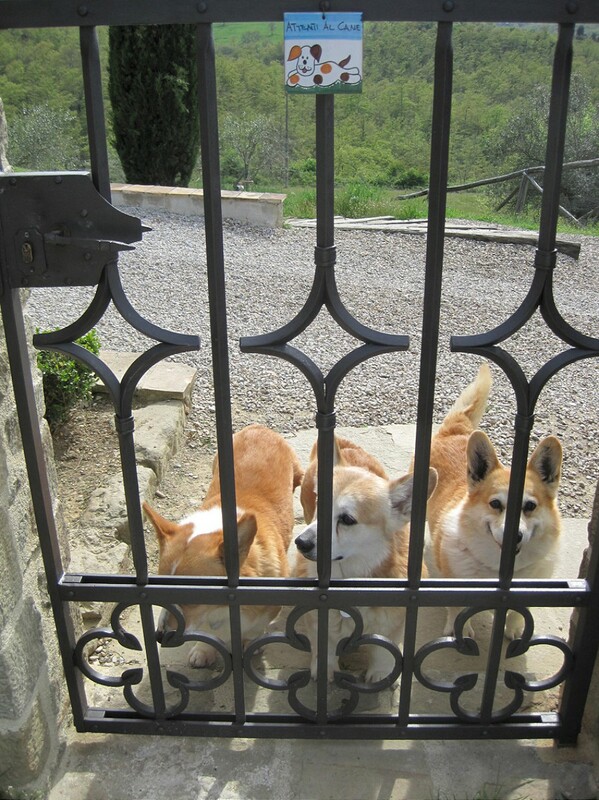 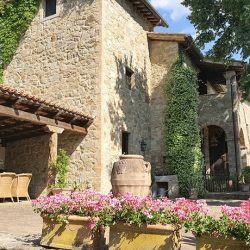 This delightful stone farmhouse is located in Passignano sul Trasimeno, Perugia, near Lake Trasimeno. 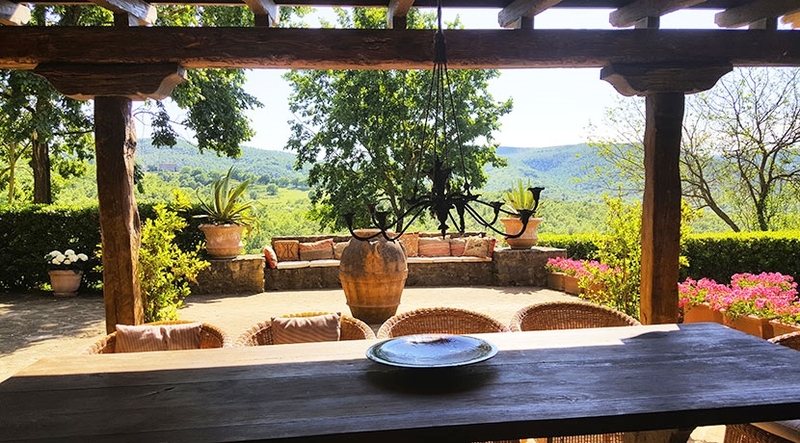 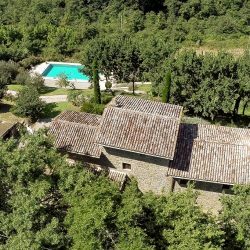 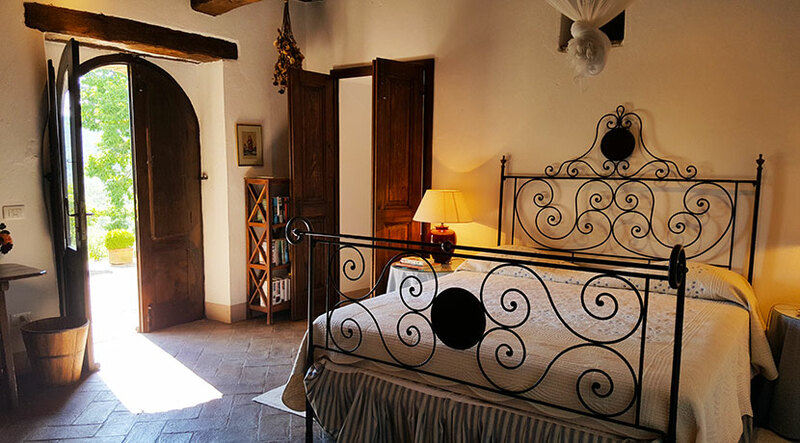 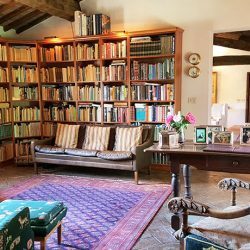 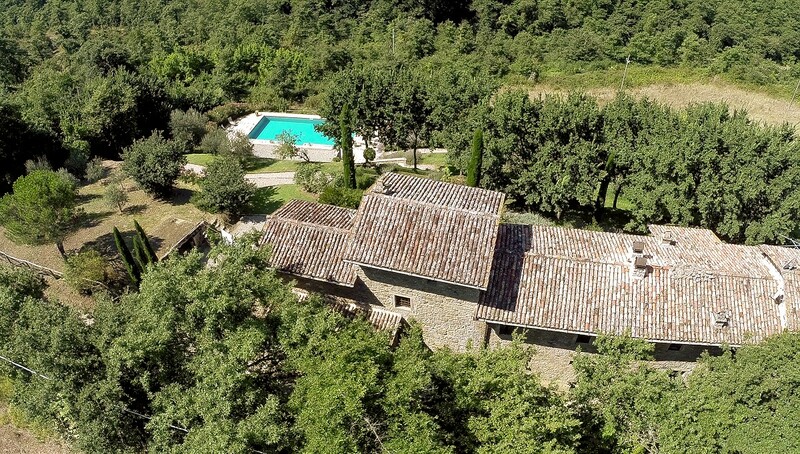 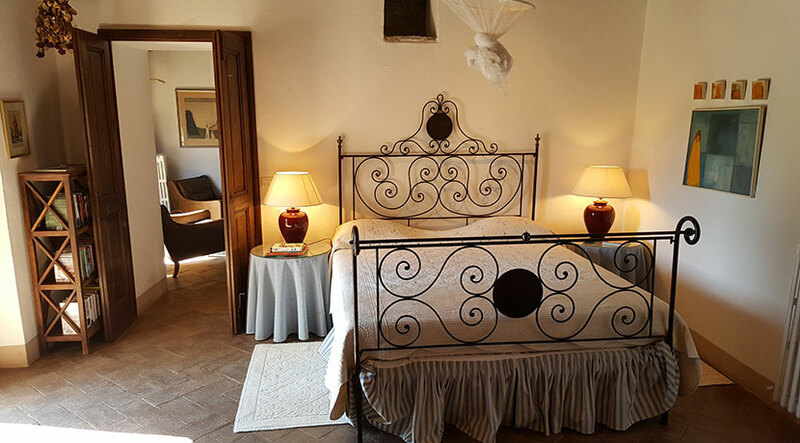 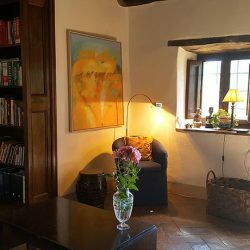 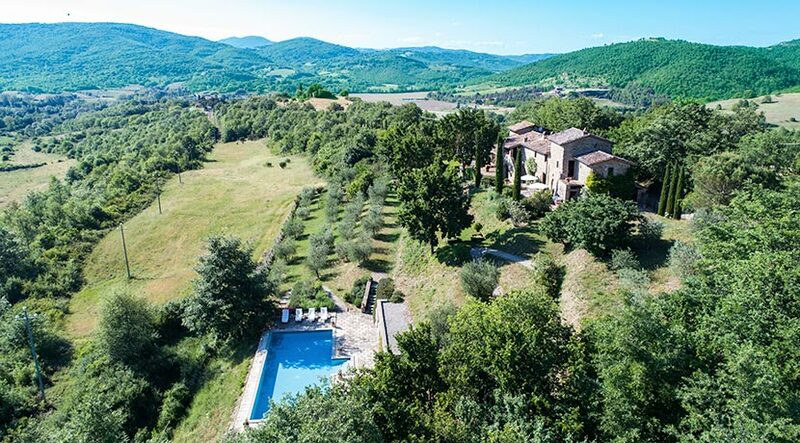 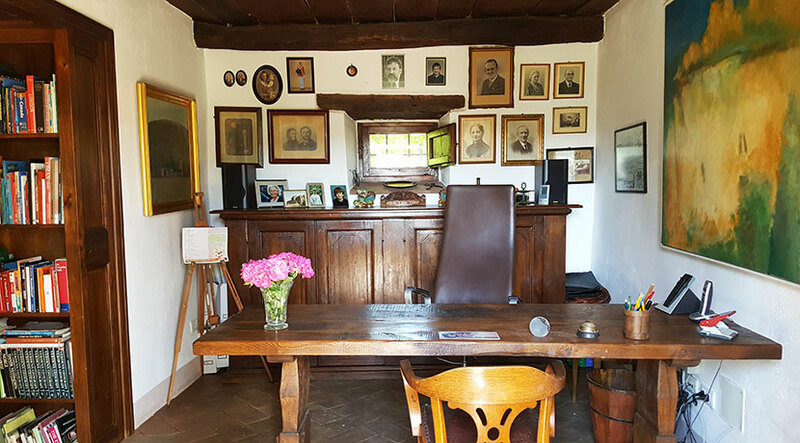 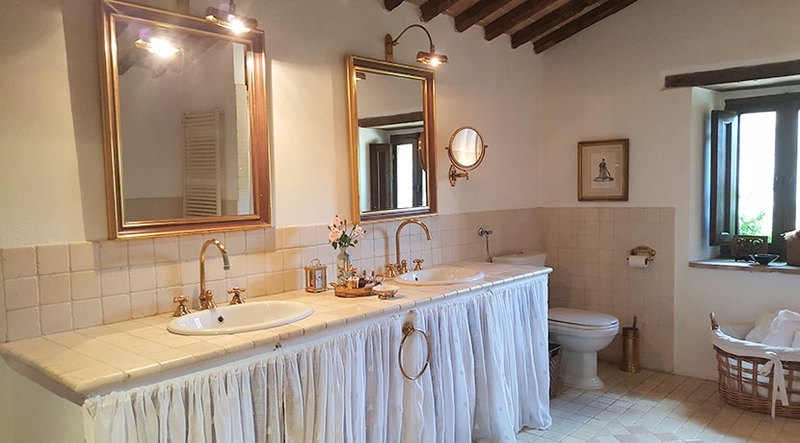 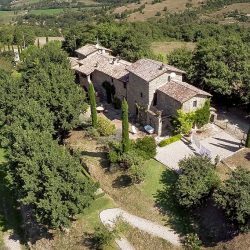 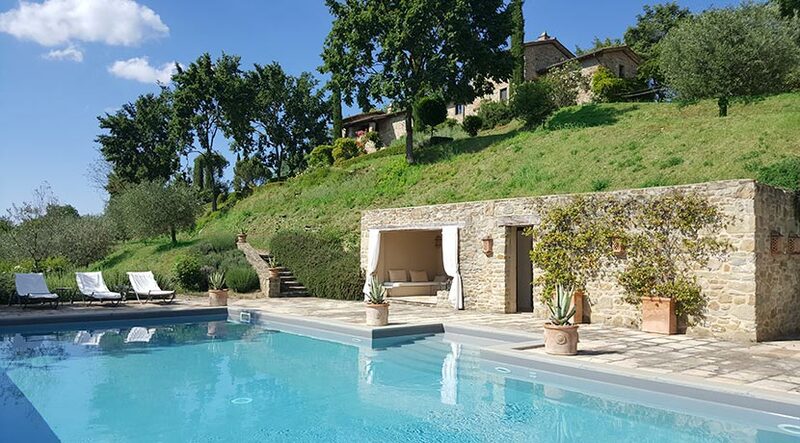 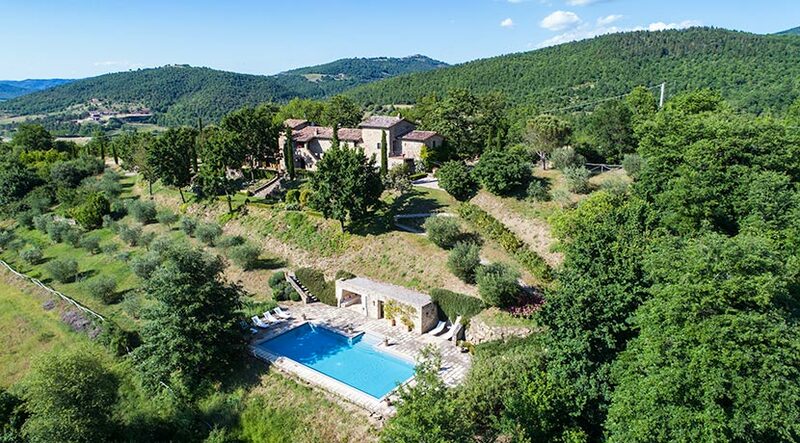 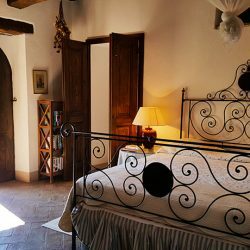 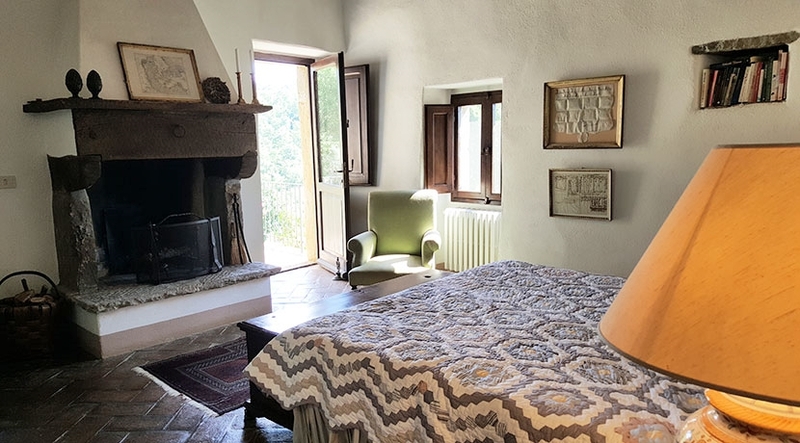 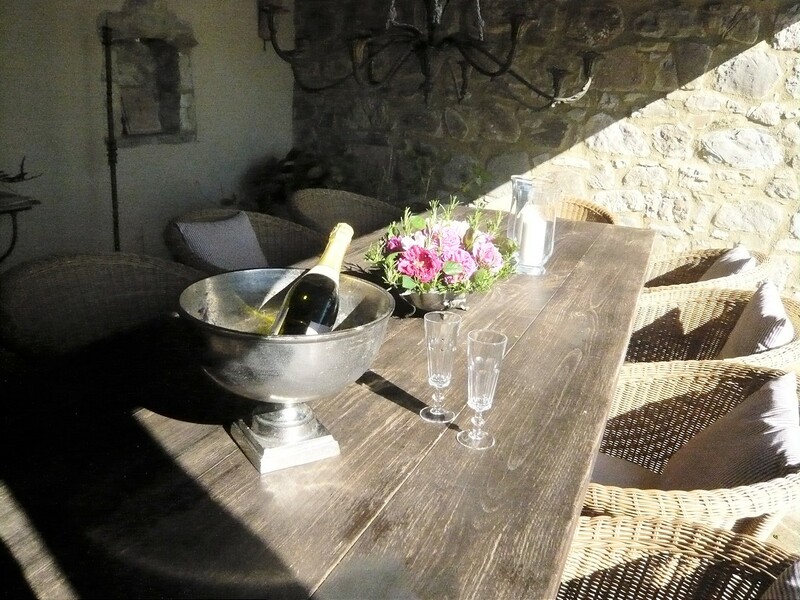 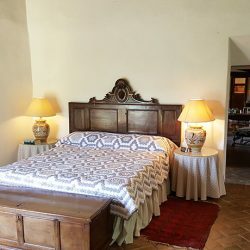 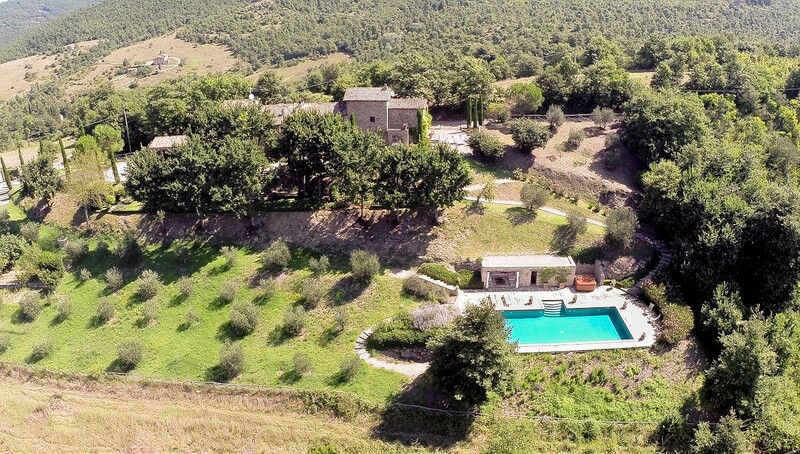 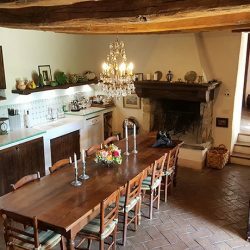 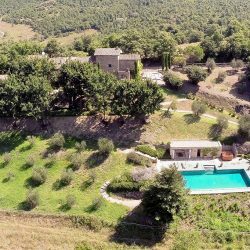 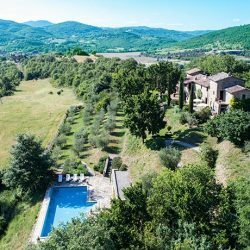 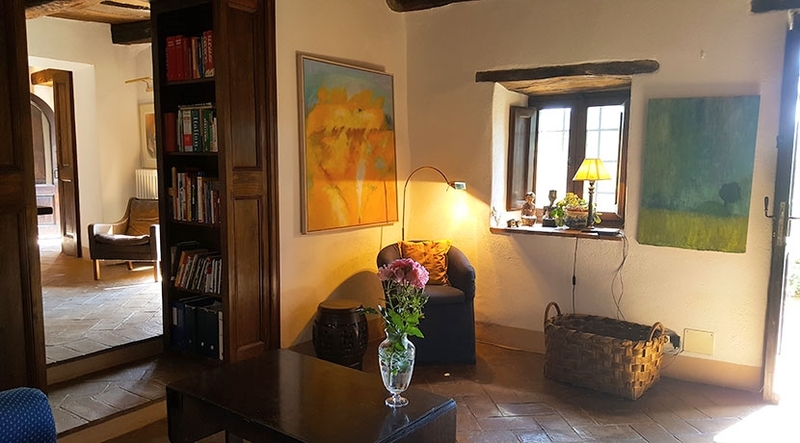 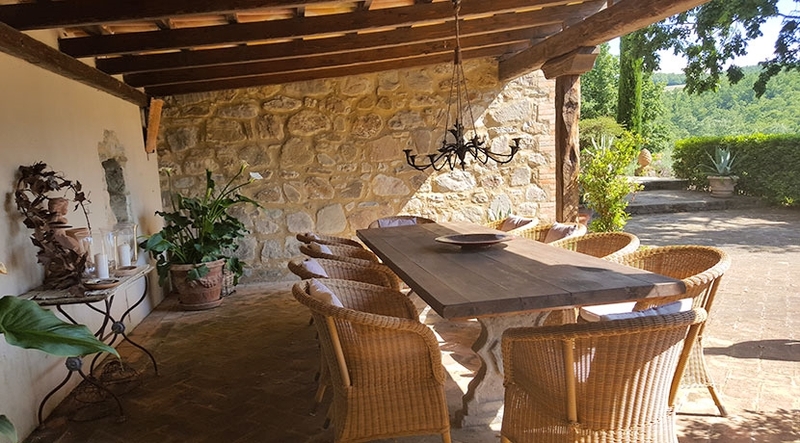 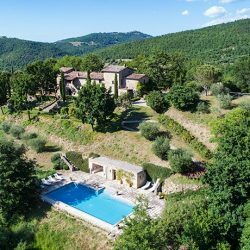 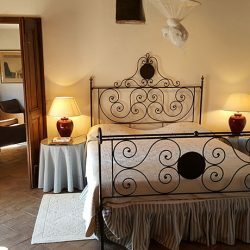 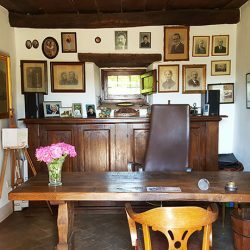 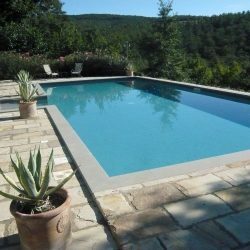 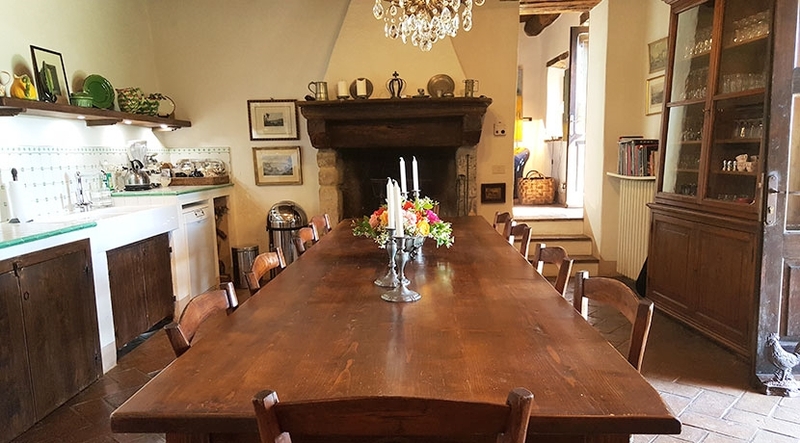 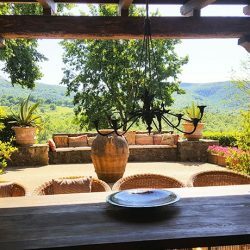 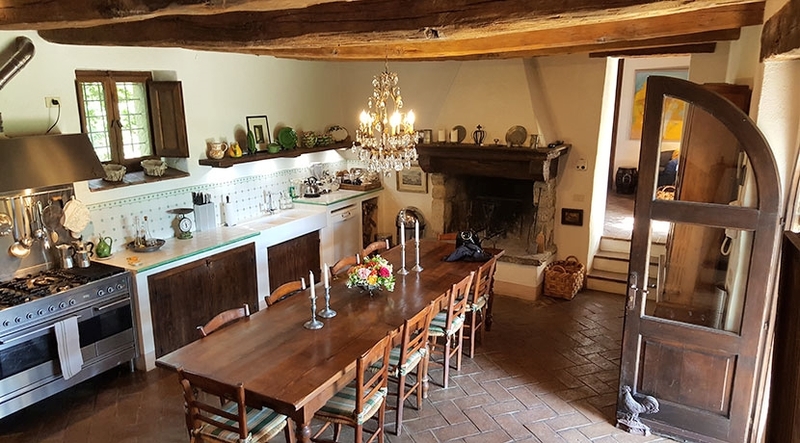 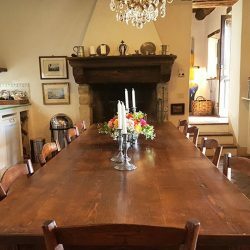 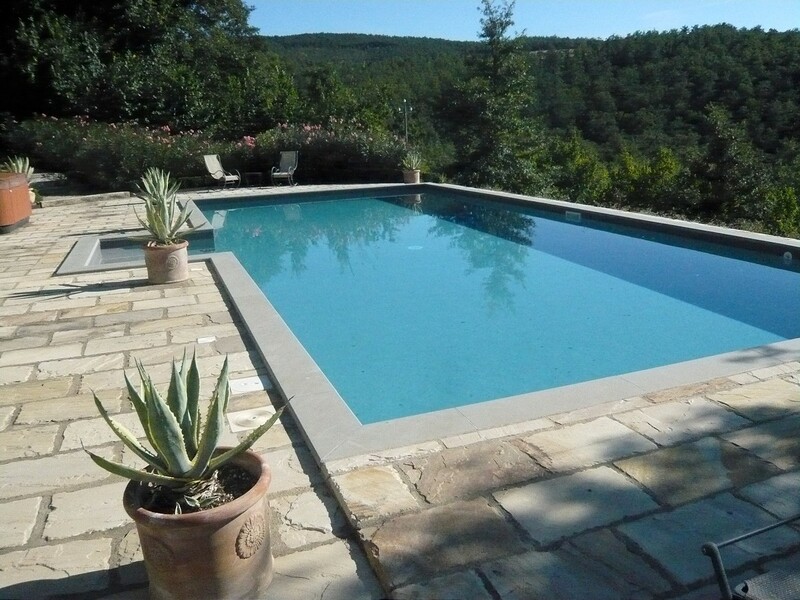 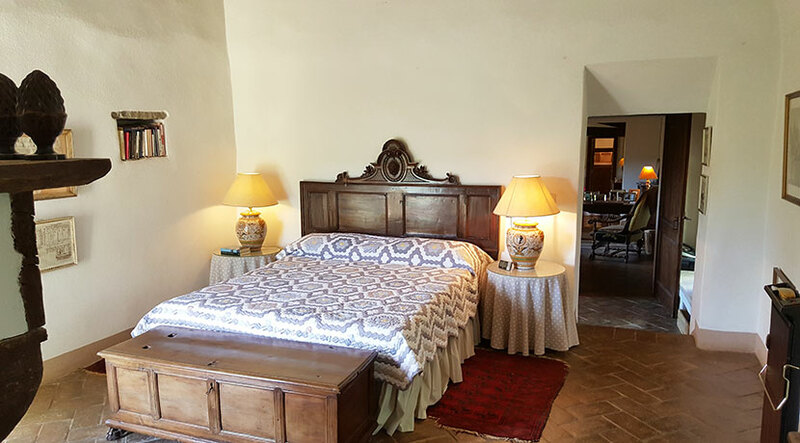 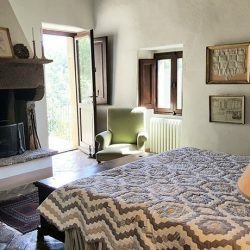 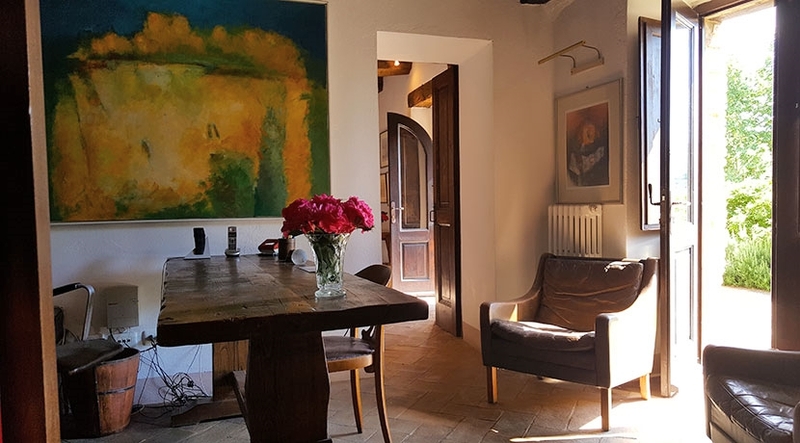 The property comprises a beautifully restored, 3 storey farmhouse of 400 sqm with 3 annexes (a limonaia used as a reading room, a technical room for the pool and a building housing a solarium and changing rooms). 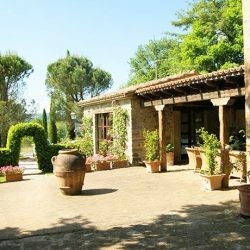 The buildings are set in a delightful, well maintained garden of 5,000 sqm with a salt water pool and 60 olive trees. 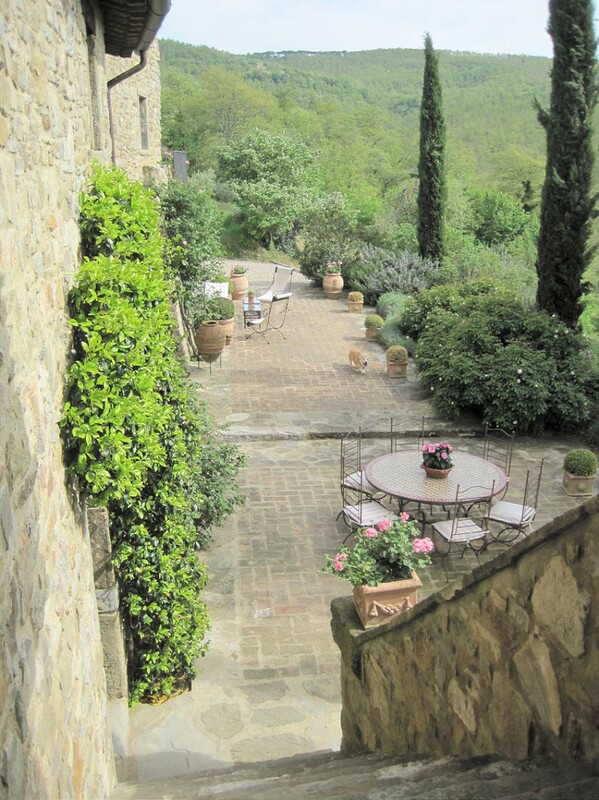 On the site of a 14th century watch tower, the central part of the property was built around 1500 and the rest 1769. 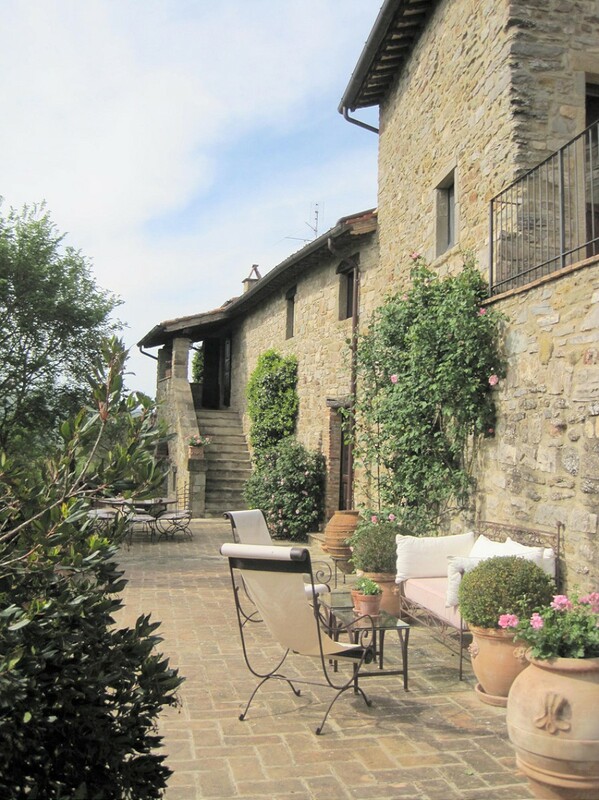 Over the centuries it has been transformed into a dwelling, extended and renovated to create the current house. 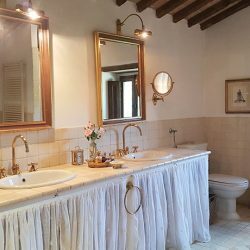 The work has been meticulous, using recovered materials to combine the traditional features of the building with all the comforts for modern life. 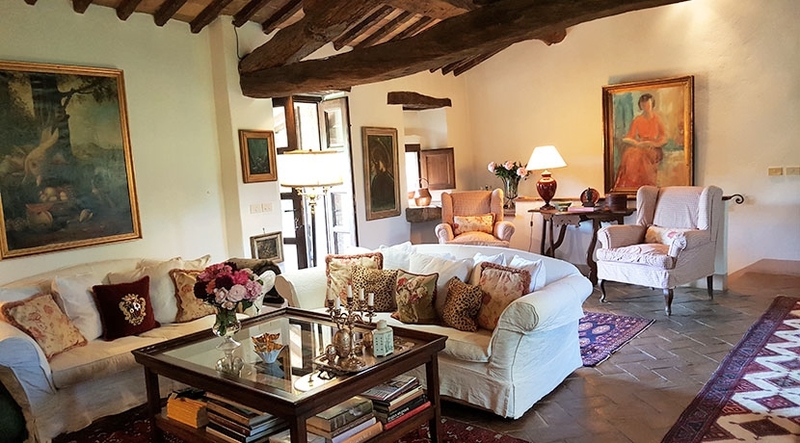 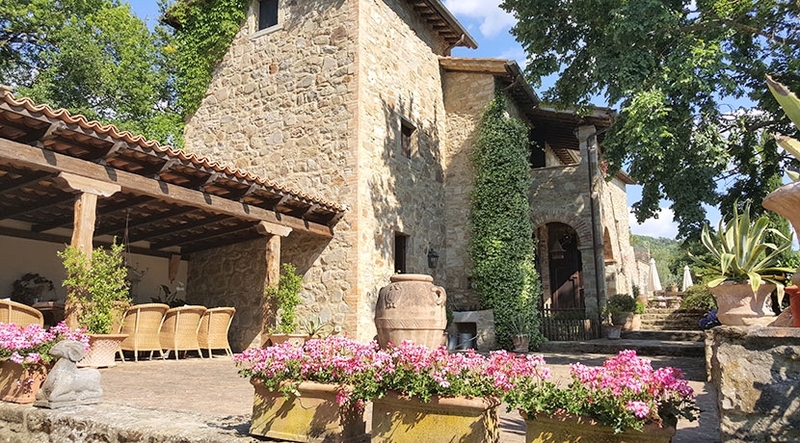 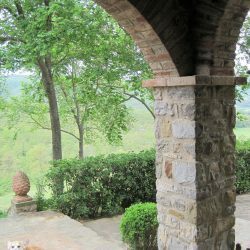 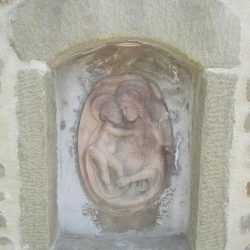 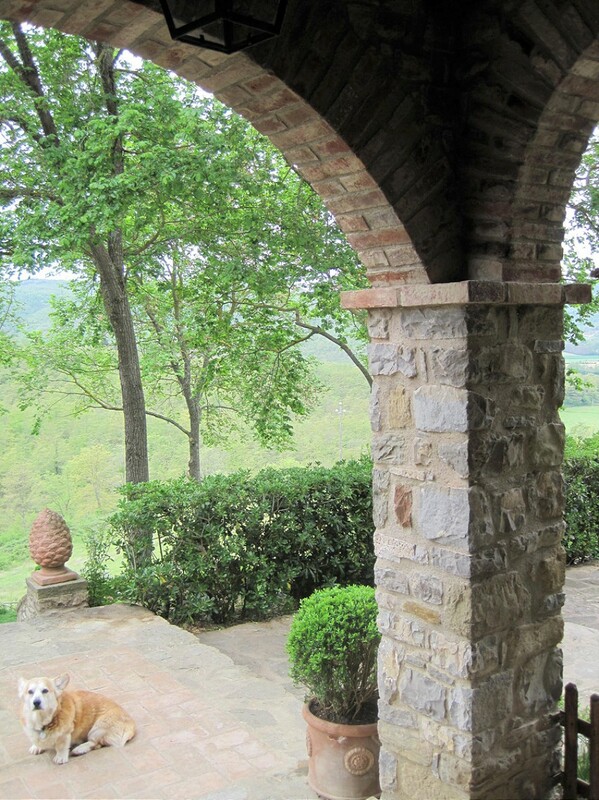 The house is full of character and features an ancient arch at the entrance, a stone fireplace with hand paintings by the artist Francesco di Maio, exposed beams in wood and terracotta and stone floors. 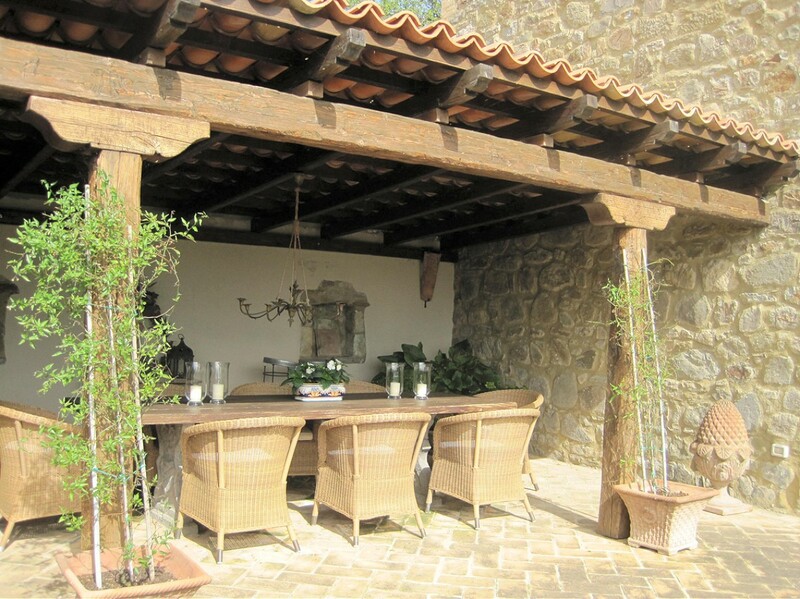 Outside there is a pergola ideal for alfresco dining, seating 14 people at the table. 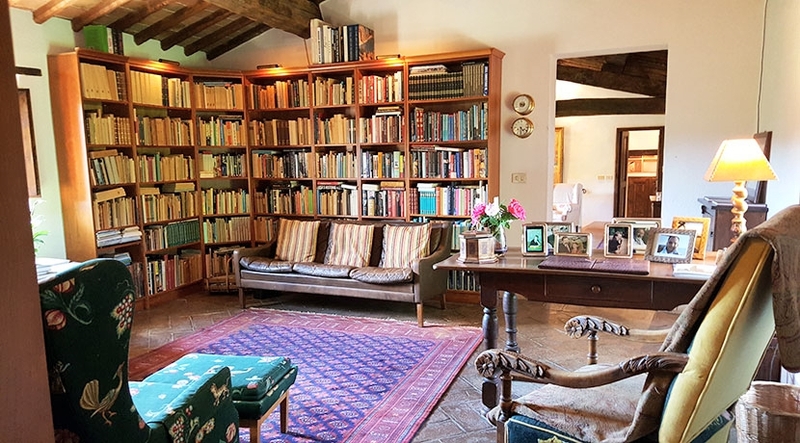 The former limonaia is a fantastic bright space for reading. 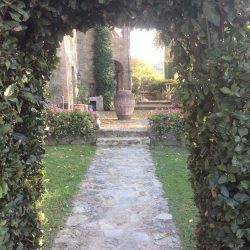 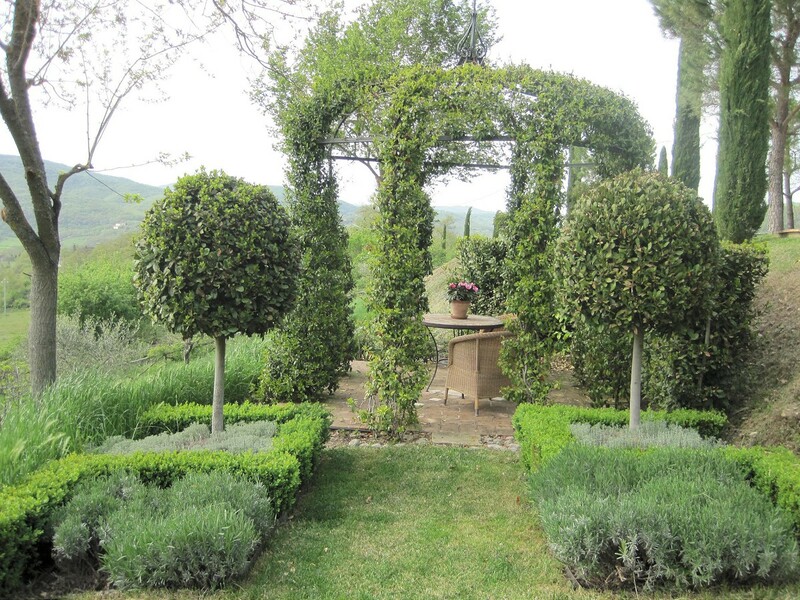 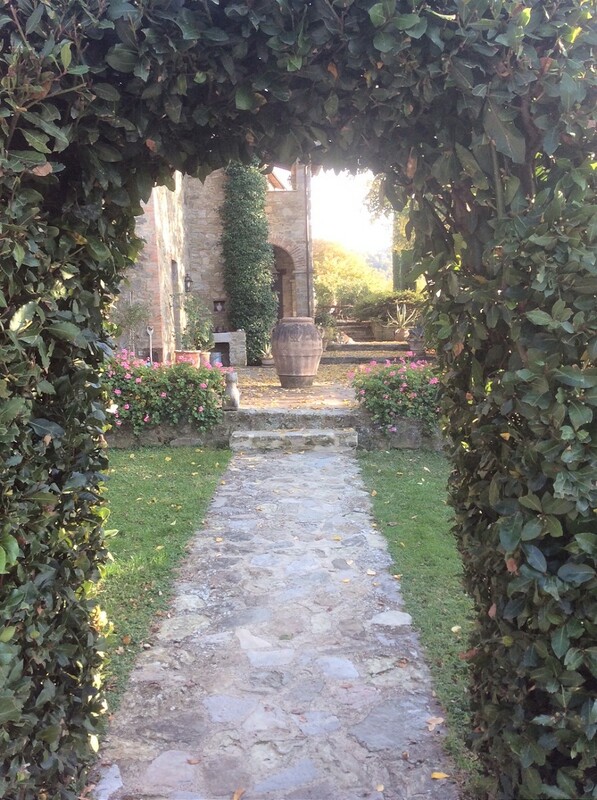 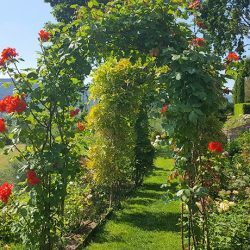 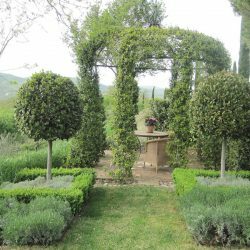 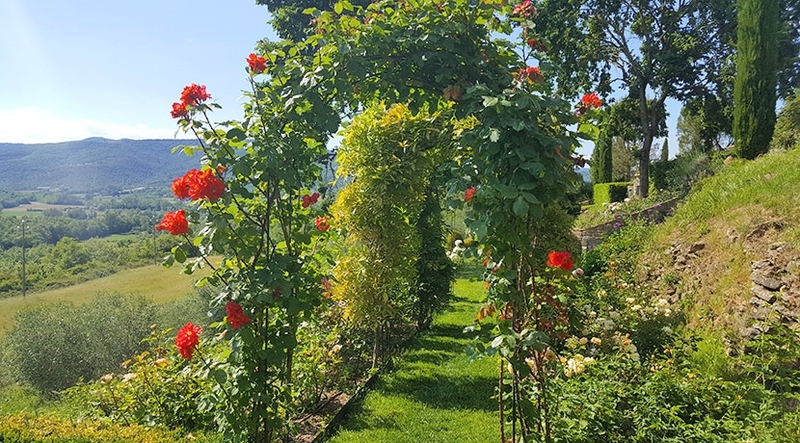 The garden has been designed with care, planted with roses, aromatic herbs, shrubs and cypresses. 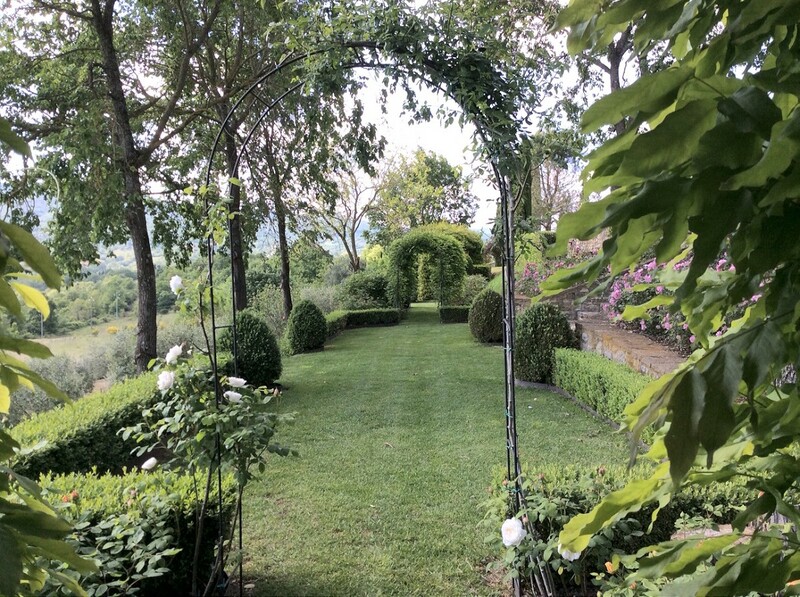 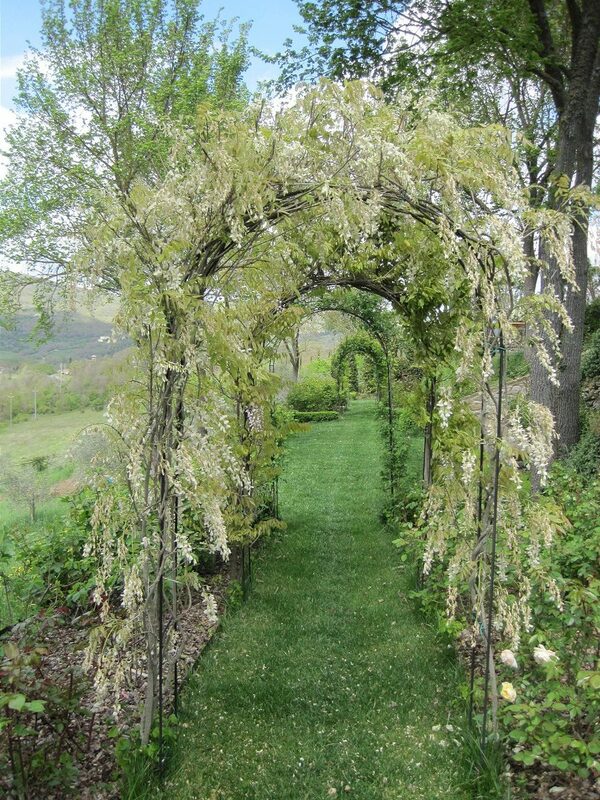 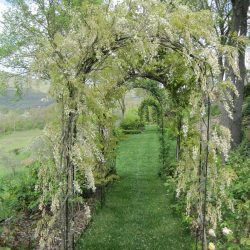 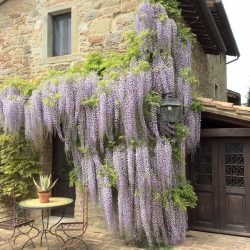 There is a wonderful wisteria that decorates the south facade of the house, an arch of flowers and paths to the pool, surrounded by 60 olive trees. 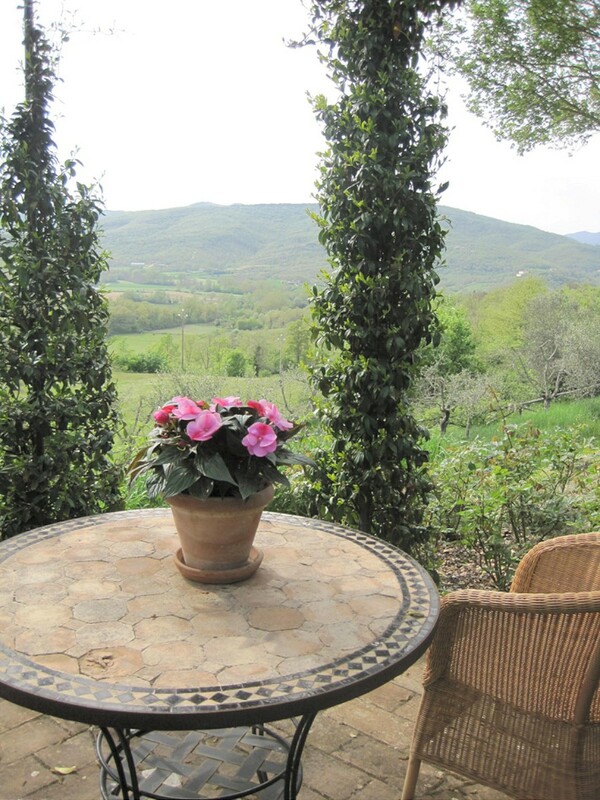 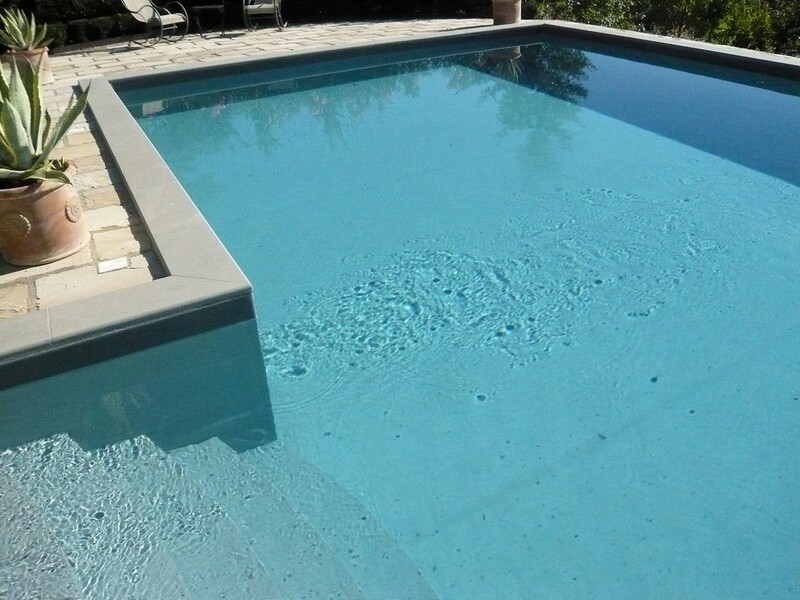 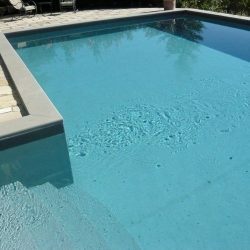 The whole property is in excellent condition, and very well maintained. 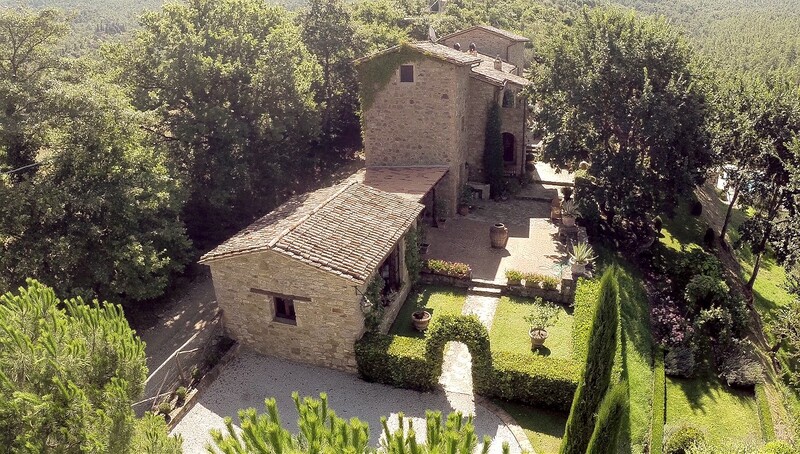 400 sqm on 3 storeys. 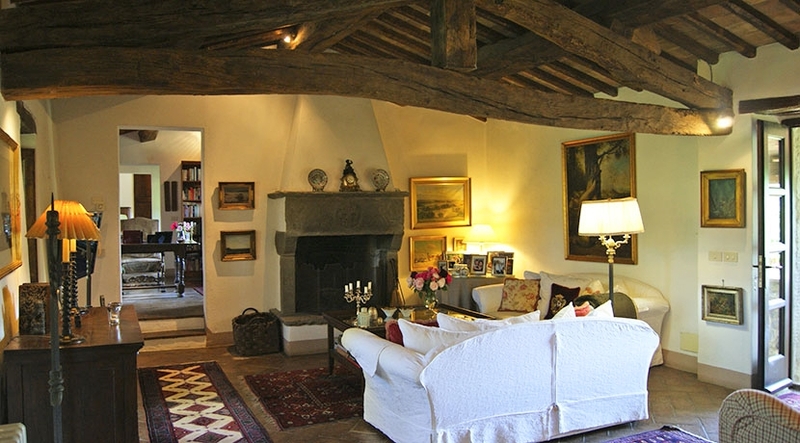 Ground Floor: Double living room with study (which could be another bedroom + bathroom), large kitchen with fireplace and dining area; a guest apartment consisting of a double studio area (which could be bedrooms), large kitchen with fireplace and access out to the terrace, larder, bathroom. 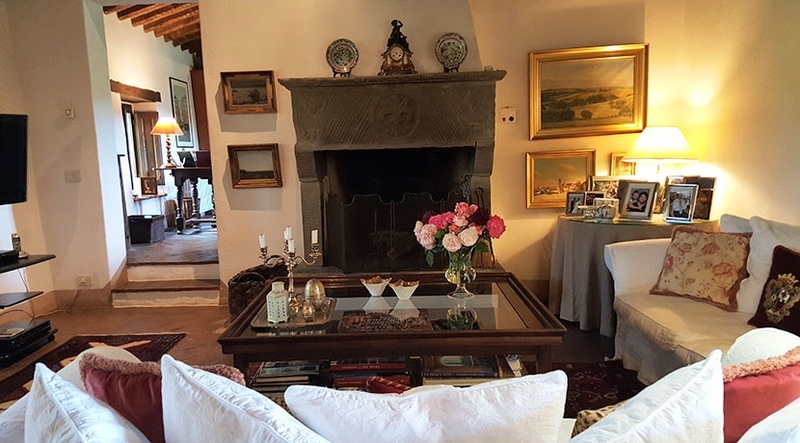 First Floor: Living room with fireplace, also accessible via an external staircase, 2 bedrooms, one of which has a fireplace and private terrace, library, walk-in wardrobe, bathroom. 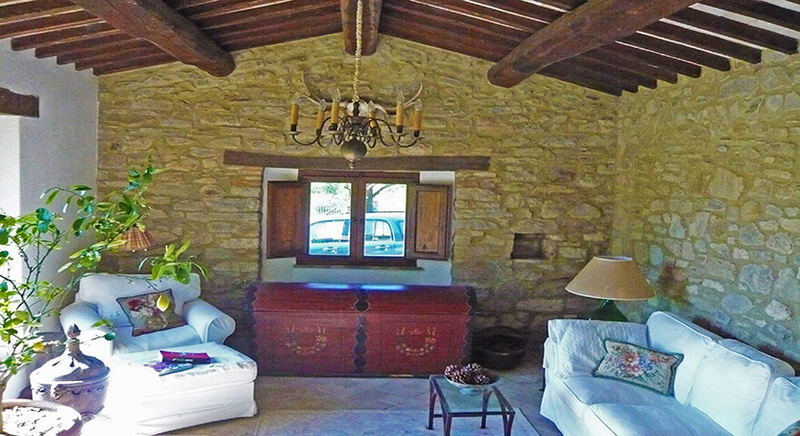 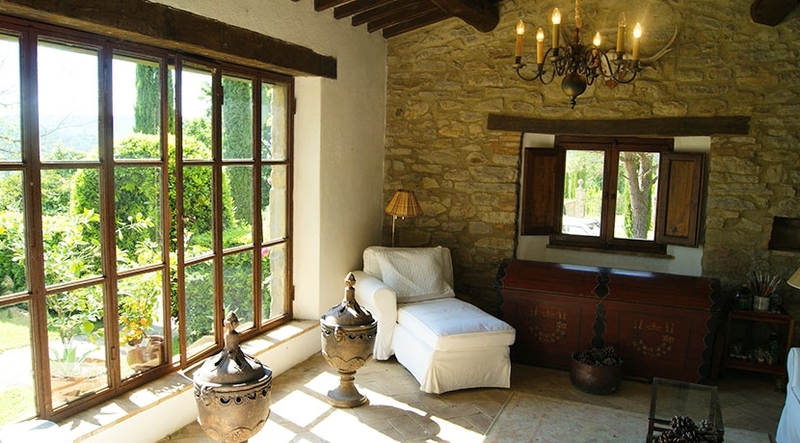 Restored stable / limonaia of 25 sqm, now a sitting / reading room. 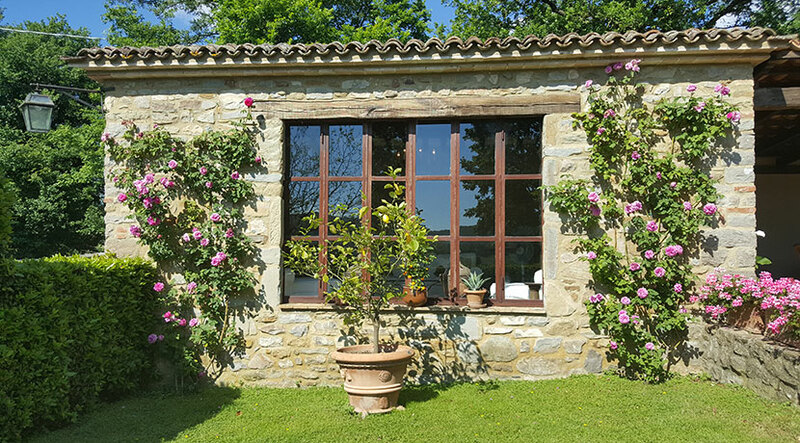 Outbuilding with solarium, changing room, toilet and connections to install a sauna. 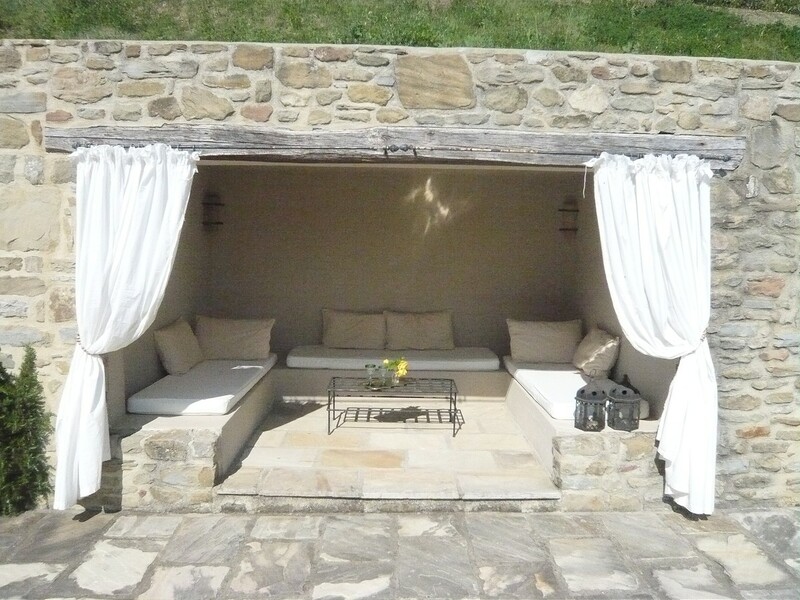 Outbuilding housing technical rooms and and pool storage area. 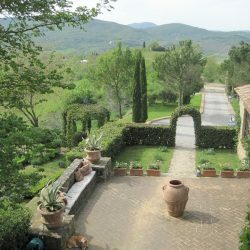 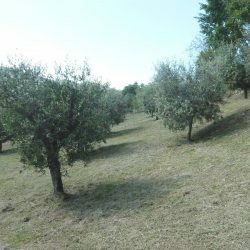 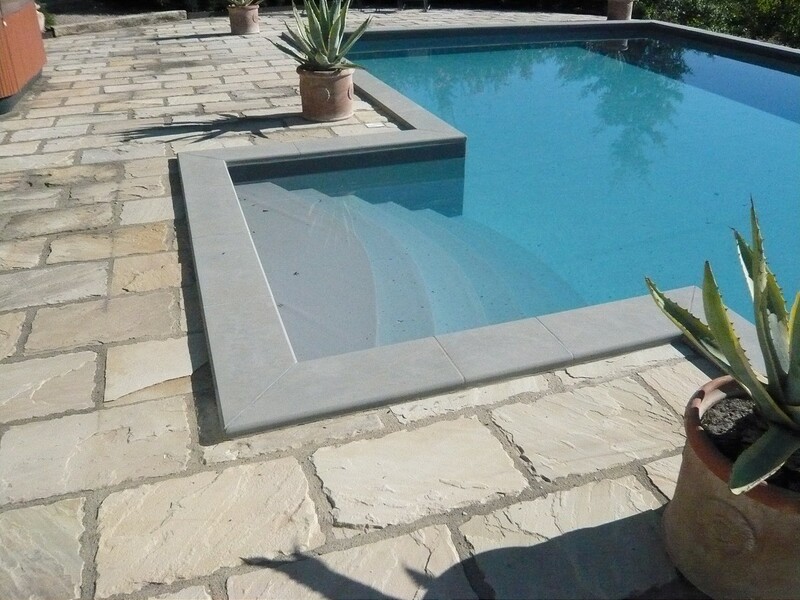 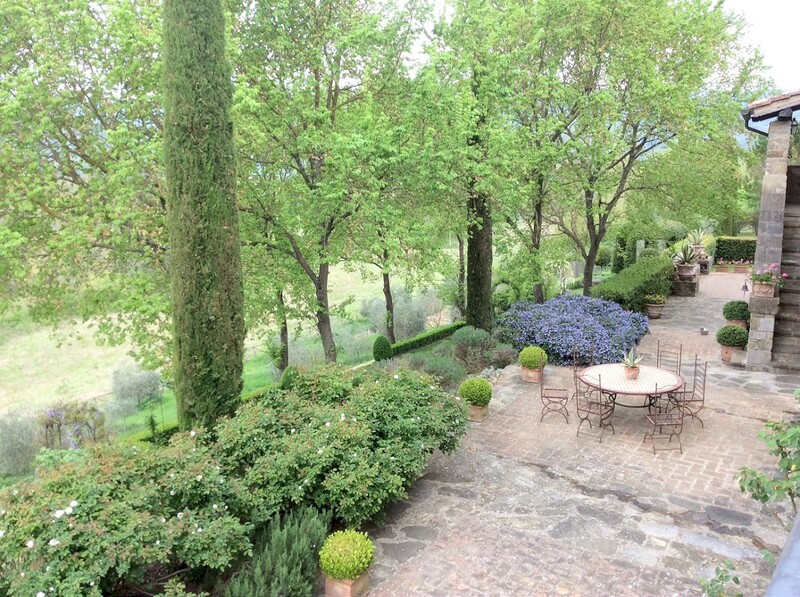 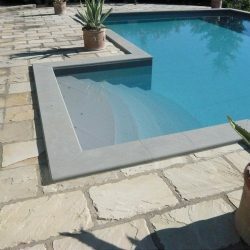 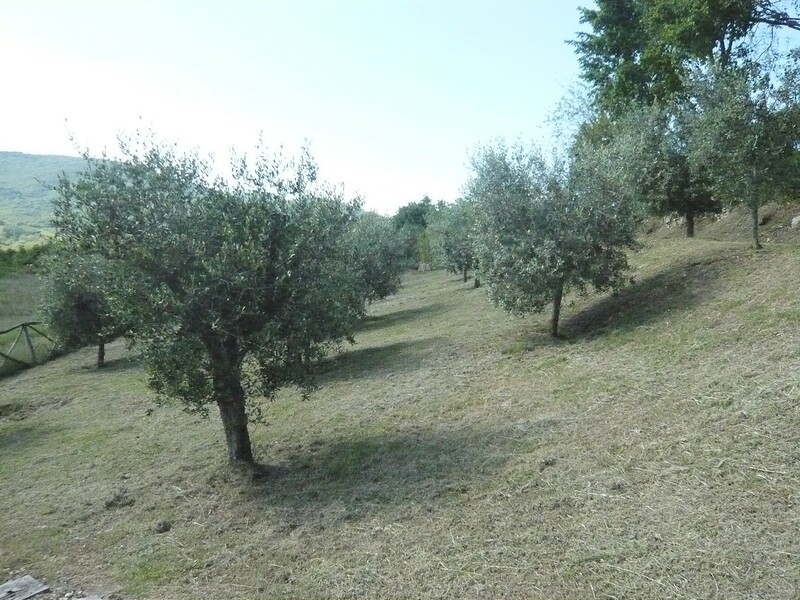 5,000 sqm beautiful fenced garden with a salt water pool (14m x 6m), vegetable garden and 60 olive trees. 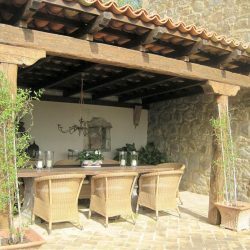 Terrace and pergola, ideal for alfresco dining for up to 14 people. 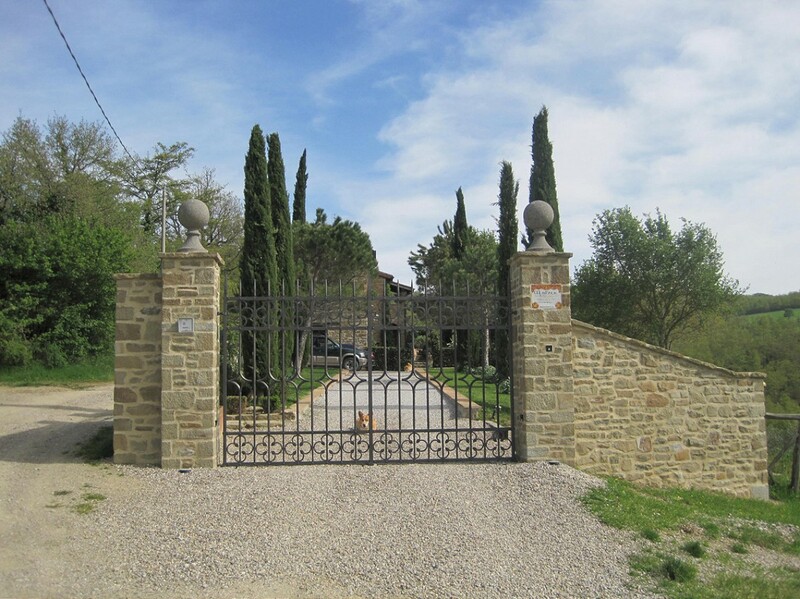 Access via 1km gravel road. 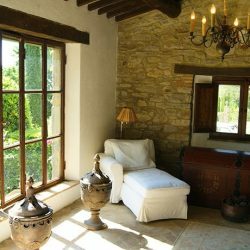 Mains water and electricity, well for irrigation, LPG heating + wood stove, phone line, wifi, alarm system, irrigation system, satellite TV. 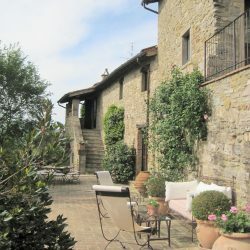 Perugia 40 km, Florence 147 km, Rome 229 km.